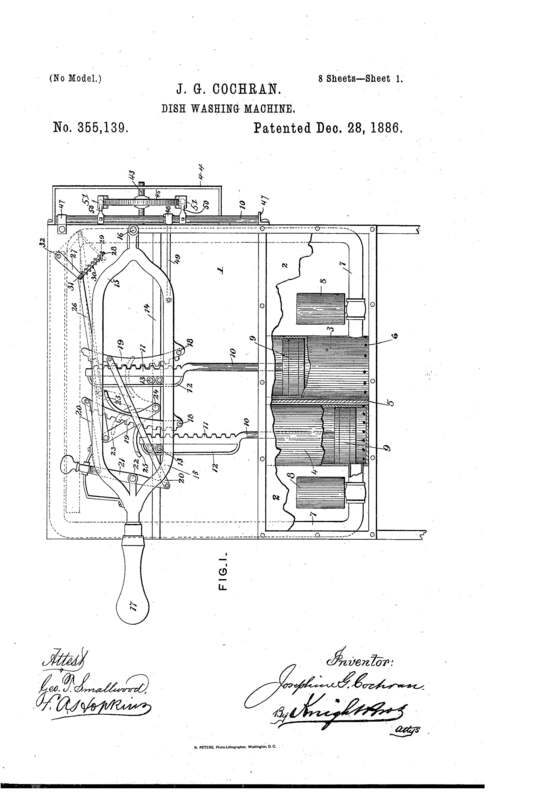 On December 28, 1886, Josephine G. Cochrane was granted the patent for “Dish Washing Machine”, U.S. Patent No. 355,139. Josephine G. Cochrane was born on March 8, 1839, in Ashtabula County, Ohio. She lived with her father who was a supervisor at a mill as a hydraulic engineer. After graduating high school, Josephine married William Cochran at the age of 19. Josephine took her husband’s name but put an “e” on the end of it as she was known for her independent nature. The Cochrans hosted many dinner parties as William became an affluent, dry goods merchant, investor, and politician who started to rise in the ranks of the Democratic Party. In 1883, William Cochran died and left Josephine with a large sum of debt and only $1,535 to her name. Her invention was no longer just a dream but a way to survive financially. She worked relentlessly on her dishwater and the final product had wire compartments in the shape of a wheel where dishes such as silverware, plates, cups, and saucers were placed. A motor turned the wheel and covered the dishes with hot soap from the bottom of a copper boiler. You asked me what was the hardest part of getting into business, I think, crossing the great lobby of the Sherman House alone. You cannot imagine what it was like in those days … for a woman to cross a hotel lobby alone. I had never been anywhere without my husband or father —the lobby seemed a mile wide. I thought I should faint at every step, but I didn’t—and I got an $800 order as my reward. She continued to sell her dishwashers, maneuvering her way into restaurants, hospitals, and colleges. Her success allowed her to open her own factory, the Garis-Cochran Manufacturing Company, in an abandoned schoolhouse. She continued to personally sell her dishwashers until her death in 1913. Her company was bought by Hobart which, was later purchased by KitchenAid®, who owns the registrations to Cochrane’s patents and trademarks. KitchenAid was bought out and is now the Whirlpool Corporation. The automatic dishwasher is now a staple in homes across the country. Every time you load the dishwasher and don’t have to hand wash dirty dishes you can thank Josephine Cochrane. Suiter Swantz IP is a full-service intellectual property law firm, based in Omaha, NE, serving all of Nebraska, Iowa, and South Dakota. If you have any intellectual property questions or need assistance with any patent, trademark, or copyright issues and would like to speak with one of our patent attorneys please contact us.